Vampires look distinctly different from unaffected persons; their faces, which cover their fangs, are unusually pale, and the eyes of some breeds of hungry vampires turn blood-red until their thirst is sated. Vampires are unable to age and are immune to disease; while not impervious to death, a vampire may be killed only by meeting a violent end. "Ancients" are the oldest vampires (they may be hundreds or even thousands of years old). A vampire's skin is extremely susceptible to sunlight and flame, so much so that contact with it burns the skin. When they die, their dust can be collected and used as an alchemical ingredient. Documents describe vampires being turned to dust even without being slain by flame. Rumors hold that entering places of worship may cause a vampire pain. Exact abilities are determined by the type of vampire. Vampires that have been given their condition directly from the Daedric Prince Molag Bal are known as pure-bloods or Daughters of Coldharbour if they are female. Due to their unique nature pure-bloods enjoy greater status among their kind and will usually hold their "half-breed" descendants in low regard. Pure-bloods are likely the main reason for the various strains of vampire bloodlines as the vampirism the Daedric Prince endows varies from individual to individual; the only notable exception to this is the ancient Volkihar clan, whose entire family was given the same strain. The difference between pure-bloods and their descendents other than their origins, status, and purity is that they may possess additional abilities. Appearance-wise they will look the same as the other vampires in their respective bloodline. The progeny and grand-progeny of a pure-blood may retain their additional abilities but will still be regarded as lower than their sire and grandsire. The most defining characteristic of vampires is their unnatural, insatiable need for blood. A hybridization of a plant and vampiric blood led to plants with a similar, voracious hunger for blood, among other things. Blood may not be needed to stay "alive", but doing without it can cause a vampire to become extremely weak and rabid, though some types of vampires will instead become stronger and more vampiric. However, they will still become rabid after too long without blood and in some cases, can fall into a coma. Consuming blood also allows some vampire bloodlines to maintain a more inconspicuous appearance, dulling their vampiric qualities but may improve their health and regeneration. If a vampire's bite leaves its victim alive after a feeding, the vampire risks passing its disease to the victim. Blood itself may not be needed to keep a vampire healthy; it is suggested that vampires are able to drain a warmblooded creature's "life force" to replenish their own. Vampires are essentially parasitic and don't actually need to kill their victims during feeding, however, either out of a frenzied blood-lust or to avoid potential competition, most victims are drained completely. Only two known bloodlines are shown to be able to restrain themselves by feeding without killing, though this is out pragmaticism and most victims suffer a fate worse than death by being kept captive by vampires to be fed on continuously. Vampires are capable of eating mortal food with no ill effects but won't derive the sustance they need from it. The Opusculus Lamae Bal ta Mezzamortie tells of how the curse of vampirism came about, owing its creation to the Daedric Prince Molag Bal. The tale goes that Molag Bal disliked Arkay, an Aedra who showed great pride in his sphere of influence, the cycle of life and death. Molag Bal traveled to Tamriel (still newly-formed at the time), where he savagely raped the Nedic woman Lamae Beolfag and then departed Nirn. Lamae was found and nursed by nomads, but death eventually overtook her. On the night of her cremation, she rose again and brutally murdered the nomads. Dubbed a Daughter of Coldharbour‎, she then created more vampires, spreading the curse across Tamriel and making a mockery of Arkay's cycles. In actuality, Lamae did not die at all but was rapidly healing from her wounds which frightened the local nedes. In fear of the disease that was spreading through Lamae, they tried to cremate her but she awoke and slaughtered them all. Once she came to her senses she was horrified of what she had done and what she had become. She beseeched Arkay only for him to forsake her. In retaliation, she began spreading vampirism to his followers. Since then, many mortals have made pacts with Molag Bal to become vampires, given rise to new bloodlines of vampires. 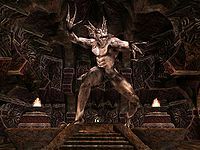 The beginnings of vampirism have variations in the Dunmeri Temple doctrine, with Molag Bal spawning the first vampire from a defeated foe, such as a Daedra Lord, a Temple Saint, or a "powerful beast creature". Indeed, multiple origin stories may have truth to them, as in the case of the Volkihar vampires of Skyrim, who descend from a single family that were given their abilities from Molag Bal directly. These multiple pureblooded vampires can create their own bloodlines, with unique abilities and characteristics. The association of vampirism with Molag Bal may be one reason the Mace of Molag Mal, which allows the bearer to absorb an enemy's magicka, is also called the Vampire's Mace. Of course, anything which absorbs power from a victim is often associated with vampires, such as the strength-sapping Vampiric Cloud spell, the Ebony Blade (also called the Vampire), and the Vampiric Ring. Vampirism is contracted through any sort of wound inflicted by a vampire; however, since few survive attacks from a vampire, the actual contraction process is not understood well. The newly-infected will exhibit no symptoms for the first 72 hours (except perhaps nightmares and insomnia), and they can be cured of the disease like any other ailment. After that time, however, the disease is said to be "incurable": the disease causes one to "die", making a vampire literally undead. Despite this, there are many documented cases of individuals who found the means to cure themselves, as discussed further below. The incubation process and the eventual turning of the vampires seems to vary as some individuals actually "die" and usually find themselves waking up in a tomb, others such as Lamae, actually began healing rapidly rather than dying, though a book about her incorrectly states she died before her transition. Although a vampire spreading its disease to another can be seen as a form of reproduction, at least one male vampire has been documented to have fathered a child with a living partner. The Journal of the Lord Lovidicus recounts how an Imperial impregnated an Orc woman, resulting in a male Orc child, but it is unknown if the child inherited the disease or any part of it. Vampires have been known to spread vampirism via bites, scratches or by using a vampiric drain spell, the mechanics depend on the bloodline of the vampires as some vampires, such as those of Lamae Beolfag's bloodline, are required to give their victims their own blood after draining their victim of some blood. The disease is thought to be incurable by the Dunmer of Morrowind. However, a Buoyant Armiger named Galur Rithari claimed that he was cured of the disease. In his papers, the Armiger states that while he was a vampire, he undertook a task from Molag Bal at a shrine, and after the completion of the quest, he was cured of vampirism. Rithari later disavowed his claim due to coercion from the Tribunal Temple. At least one other has successfully sought a cure from Molag Bal, though the Daedric Prince actually acquired the cure from Vaermina. This suggests that Vaermina is somehow connected with vampirism, also, which is somewhat compatible with her sphere of evil omens. It's said that at least some forms of vampirism can be cured by eliminating the bloodfather of the applicable bloodline. Finding and eliminating a bloodfather is very difficult, but by doing this, the whole clan of vampires will also be cured (some of them may die instantly as a result of old age). Another report from a supposedly cured vampire also suggests that curing the disease is possible, although it gives no clues as to how. One method to cure the disease involves bathing in water containing a mysterious ingredient known as Purgeblood Salts. The witches of the Iliac Bay caught the attention of the Mages Guild by apparently curing the disease. The cure is a potion, consisting of six cloves of garlic, two shoots of bloodgrass, five leaves of nightshade, the blood of an Argonian, and the ashes of a powerful vampire; these same ingredients were used to cure Count Skingrad's comatose wife, Rona Hassildor, of her vampirism though the process of being cured resulted in her immediate death. One method for combating the spread of vampirism, which is now lost to history, was a potion which turned the drinker's blood into a powerful poison capable of killing a vampire which attempted to feast. There are tales, the veracity of which can't be determined, that there are other, mystical ways of curing vampirism. 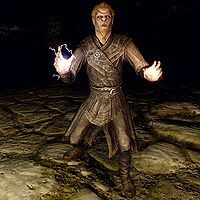 Falion, a wizard of Morthal in the Fourth Era, was able to cure vampirism with a ritual involving a filled black soul gem (and hence a human soul) and an incantation invoking the powers of Oblivion. Little else is known of the ritual. A less ideal option is exposure to lycanthropy. The blessings of Hircine can replace the infected with lycanthrope blood, but this comes with its own particular set of complications. Molag Bal is the Daedric Prince who created the first vampire as well as the later pure-blooded vampires of other bloodlines and is consequently responible for the entire species, because of this, he is sometimes worshiped for this reason. However, other Daedric Princes have contributed to the species as well; the Cyrodiilic bloodline honors Clavicus Vile for giving them the ability to blend in with mortals. The book written about Lamae's bloodline and their unique vampirism theorizes that Hircine is responsible for their ability to withstand the sun, though the author considered it a wild theory. The vampires of Tamriel are commonly grouped by their territory and bloodline. A vampire's bloodline is determined by the vampire who infected them, which in turn affects their abilities. Vampire clans normally consist of vampires of the same bloodline, or who share the same feeding grounds. Some clans are powerful enough to have established strongholds and hold captured cattle: prisoners, or thralls, who they feed off of regularly without turning them into vampires. Lamae Beolfag was the first of her kind and like her successors, she created a bloodline. Vampires of this particular bloodline have Noxiphilic Sanguivoria rather than Porphyric Hemophilia or Sanguinare Vampiris. Noxiphilic Sanguivoria allows these Vampires to not burn or weaken in sunlight, but instead become more powerful once night falls. They have other abilities as well; some, such as invisibility, they share with other bloodlines. One particular way of acquiring this strand of vampirism is through the Rite of the Scion, a ritual in which a mortal's blood is fully replaced by that of Lamae's. This act turns mortals into Scions, a powerful type of vampire. It is also the only way for a soul shriven to be infected with this strand of vampirism. The exact name of this bloodline is unknown, but it was extremely common in the Second Era and could be encountered nearly all over Tamriel. Members of Lamae's bloodline are taught to despise both Molag Bal and Arkay, in accordance with Lamae's own disdain for said deities. Lamae is seemingly responsible for the creation of several other bloodlines aside from her own, whether this ability is unique to her as the first vampire or a seemingly potent ability of her bloodline to create a sub-bloodline is unknown. The Whet-Fang vampires of Black Marsh are known to capture victims alive and keep them in a magic-induced coma, allowing the vampires to extract blood at their own leisure. The vampires of Cyrodiil believe the Whet-Fang vampires show "signs of enlightenments," regarding them as more intelligent than the other "barbaric" tribes. For this reason, the Order considers them a possible threat to their dominance in Cyrodiil. Only one known tribe exists in Cyrodiil and their true name has been lost to history. Much like the Imperials of the area, they ousted their competition. Indistinguishable from the living if well-fed, these Cyrodiilic Vampires are cultured and more civilized than vampires of other provinces, experts of concealment, and use their stealthy abilities to feed on the sleeping and unaware. Calling themselves the Order, these vampires follow the Daedric Prince "Kin-father" Molag Bal, like many other vampires, but they also consider Clavicus Vile their patron. Members are bound never to reveal themselves or the Order and to procure power, stature, and wealth whenever possible. However, despite this strict structure this doesn't seem to be a cohesive organization or any line of authority. The Iliac Bay region hosts many bloodlines of vampires, each with their own special abilities: the Anthotis, Garlythi, Haarvenu, Khulari, Lyrezi, Montalion, Selenu, Thrafey, and Vraseth. The clans inhabit their own regions, and a strong sense of rivalry is present. Some vampires in Iliac Bay became soldiers in an army of undead which ruled over the Barony of Dwynnen around 3E 253. The Lyrezi, Selenu and Vrasath bloodlines were seemingly created by Nedes who were turned by Lamae Beolfag after she rose from her pyre. The vampires in the Glenmoril Coven live in the Breton cities of High Rock, though no information about their abilities or feeding habits is known. It is known, however, that they are one of the tribes considered more intelligent (and threatening) by the Order vampires of Cyrodiil; possibly implying that, like the Order, they live disguised among the normal population as stealthy manipulators. 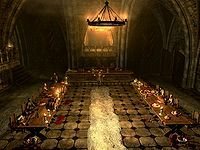 In 2E 582 a group of vampires in the region of High Rock called Rivenspire were taught how to fight their blood hunger and not to kill when feeding by an Altmer vampire named Count Ravenwatch. Despite the Count's meritable moral code and the belief that humans and vampires could live together cooperately, Ravenwatch received his vampirism directly from Molag Bal. This meant he was a pure blooded Vampire. It is unknown whether or not House Ravenwatch survived the events of the Alliance War. Another group of vampires existed in Rivenspire during the Second Era who were led by a Breton nobleman named Baron Montclair of House Montclair. Baron Montclair attempted to save his wife Baroness Montclair from an illness using an ancient Ayleid artifact called the Lightless Remnant. Instead of healing the Baroness, due to the relic's corruption it turned the entire Montclair family into vampires and the Baroness herself was changed into a bloodfiend. Unlike House Ravenwatch, House Montclair believed vampires were superior beings and sought to gain control of Rivenspire. With the help of Count Ravenwatch and the nobles of Shornhelm, the Vestige managed to destroy House Montclair and ended their brutal campaign. Despite being classed as different bloodlines or clans, most of the vampires in the Iliac Bay shared similar appearances as well as powers beyond the unique trait that each clan possessed, at least three of the known bloodlines seems to have come the from the same source, Lamae. Most, if not all, of the bloodlines of Iliac Bay seem to have the significant weakness of having their entire line cured should the progenitor be destroyed, meaning the clan's survival as vampires depends on their bloodfather's status. No other bloodline seems to have this weakness; for example, Harkon's death did not seem to have any effect on his bloodline. The Dunmer are strongly opposed to any form of necromancy making vampires largely unheard-of in their land of Morrowind. The Tribunal Temple has some control over the public knowledge of vampires, but cannot keep it completely unknown. In the past, Ordinators and Buoyant Armigers were in charge of eradicating vampires, leading to their supposed extinction. Thus, the hunting orders that exist in western Tamriel are unknown. 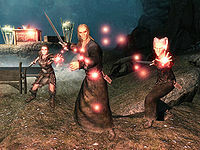 The vampires of Morrowind are typically in one of three bloodlines, which differ in accordance with their "approach to prey". The Quarra are aggressive and fierce when it comes to hunting, while the Berne clan prefer a stealthier approach. The Aundae bloodline consist of vampiric mages, who use the dark powers associated with vampirism to entrap prey. These vampires not only have their own strongholds but are also dispersed among the Daedric shrines and abandoned Dunmer and Dwemer strongholds. Ironically, these clans show great hostility to new-born vampires, considering them abominations as their living counterparts do. In the Red Mountain, the Ash Vampire was an immortal magical being of vast power. They were close kin and loyal lieutenants of Dagoth Ur, and thus partook of his supernatural vitality, but they were not related to true vampires - in fact, they are not even undead. Near the end of the Third Era, the number of vampires began to rise in Morrowind, leading to renewed calls to exterminate them. The Volkihar vampires of eastern Skyrim live under haunted, frozen lakes and only leave their dens to feed. They have the power to freeze their victims with icy breath and can reach through the ice of their dens without breaking it. They are the earliest known vampire coven in Tamriel. The Volkihar vampires are relatively similar in appearance to those of the Cyrodiil line and also share some corresponding powers like night vision, the ability to turn invisible and the ability to seduce others. Certain Volkihar vampires, however, appear more monstrous than their Cyrodiilic counterparts. They have large brow ridges, slits running vertically through their lips, and bat-like noses. These vampires have powers which aren't shared by the vampires of Cyrodiil. They can reanimate dead bodies and do not burn when in sunlight, although they are weakened by it. The Volkihar have been known to employ Death Hounds as guardians. Some of the more ancient Volkihar vampires, such as those of the court at Castle Volkihar, are pure-blooded and can transform themselves into a more monstrous form: the large, winged Vampire Lords which was a gift from Molag Bal himself. This gift grants further powers such as the ability to summon gargoyles. It is said that Potema, the Wolf Queen, relied upon vampiric generals in the latter days of the War of the Red Diamond. The Tsaesci are the "vampiric Serpent Folk" native to Akavir who, according to legend, long ago ate all the men of that land. It is unknown if their reputation as "vampire snakes" is literal or metaphorical, though like conventional vampires, they are purportedly immortal. In northern Valenwood, there are the Bonsamu vampires who are indistinguishable from normal Bosmer unless seen by candlelight. There is also the Keerilth who can disintegrate into a mist, the Yekef who swallow men whole, and the Telboth who prey on children. The Telboth are also known to take the child's place in the family and eventually murder all of the family members. Lord Harkon - A Vampire Lord who plotted to blot out the sun. Jakben, Earl of Imbel - A Third Era Imperial nobleman and master thief who became a vampire. Count Janus Hassildor - A count of Skingrad. Lamae Beolfag - The first vampire. Lord Lovidicus - An Imperial nobleman from County Anvil, father of an Arena Grand Champion. Movarth Piquine - A lowly vampire made famous due to his role in Immortal Blood. Serana - The daughter of Harkon and Valerica. Valerica - The wife of Harkon and one of the most accomplished conjurers of all time. She worked to forestall Harkon's plans for millennia. Count Verandis Ravenwatch - An Altmer count of Rivenspire. Arch-Curate Vyrthur - One of the last surviving Snow Elves, he spent millennia seeking vengeance on Auri-El for allowing him to be infected. Baron Wylon Montclair - A Breton nobleman who attempted to curse the whole of Rivenspire with vampirism. For game-specific vampire and vampirism information, see the Arena, Daggerfall, Morrowind, Oblivion, Skyrim, and ESO articles. This page was last modified on 11 November 2018, at 15:12.